What if your ability to feed yourself was dependent on a process that made a mistake 20 per cent of the time? We face this situation every day. That’s because the plants that produce the food we eat evolved to solve a chemistry problem that arose billions of years ago. Plants evolved to use carbon dioxide to make our food and the oxygen we breathe – a process called photosynthesis. But they grew so well and produced so much oxygen that this gas began to dominate the atmosphere. To plants, carbon dioxide and oxygen look very similar, and sometimes, plants use an oxygen instead of carbon dioxide. When this happens, toxic compounds are created, which lowers crop yields and costs us 148 trillion calories per year in unrealized wheat and soybean yield – or enough calories to feed an additional 200 million people for a whole year. Improving crop yields to grow more food on less land is not a new challenge. But as the global population grows and diets change, the issue is becoming more urgent. It seems likely that we will have to increase food production by between 25 and 70 per cent by 2050 to have an adequate supply of food. 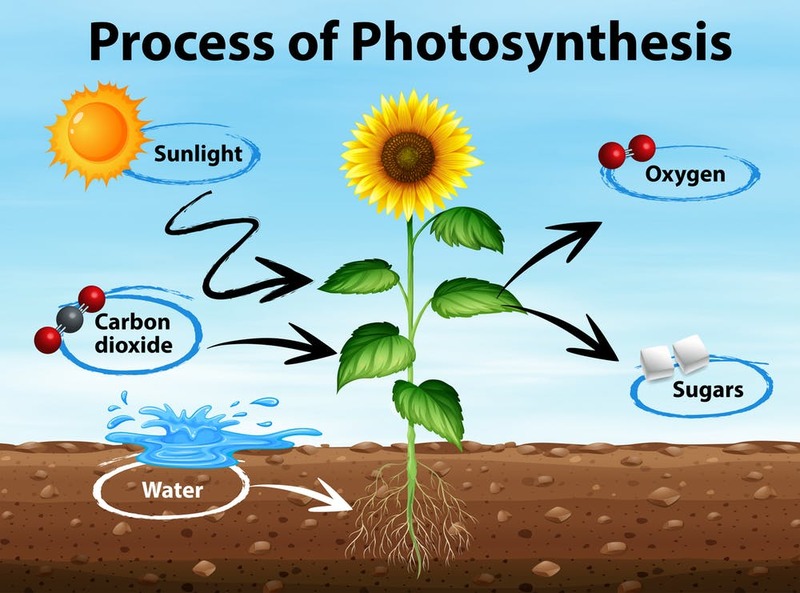 As a plant biochemist, I have been fascinated by photosynthesis for my whole career, because we owe our entire existence to this single process. My own interest in agricultural research was spurred by this challenge: Plants feed people, and we need to quickly develop solutions to feed more people. 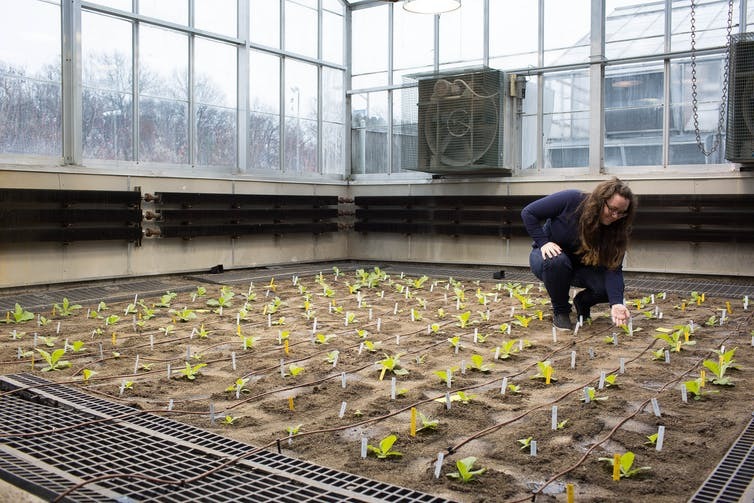 It can take decades for agricultural innovations such as improved seeds to reach growers’ fields, whether they are created via genetic approaches or traditional breeding. The high-yielding crop varieties that were bred during the first green revolution helped prevent food shortages in the 1960s by increasing the proportion of a grain-to-plant biomass. It’s the grain that contains most of the plant’s consumable calories, so having more grain instead of straw means more food. But most crops are now so improved that they are close to their theoretical limit. I work on an international project called Realizing Increased Photosynthetic Efficiency (RIPE), which takes another approach. We are boosting harvests by increasing the efficiency of photosynthesis – the solar-powered process that plants use to turn carbon dioxide and water into greater crop yields. In our most recent publication, we show one way to increase crop yield by up to 40 percent by rerouting a series of chemical reactions common to most of our staple food crops. Two-thirds of the calories we consume across the globe come directly or indirectly from just four crops: rice, wheat, soybean and maize. Of these, the first three are hindered by a photosynthetic glitch. Typically the enzyme that captures carbon dioxide from the atmosphere, called Rubisco, converts carbon dioxide into sugar and energy. But in one out of every five chemical reactions, Rubisco makes a mistake. The enzyme grabs an oxygen molecule instead. Rather than producing sugars and energy, the chemical reaction yields glycolate and ammonia, which are toxic to plants. To deal with this problem, plants have evolved an energy-expensive process called photorespiration that recycles these toxic compounds. But toxin recycling requires so much energy that the plant produces less food. Photorespiration uses so much energy that some plants, like maize, as well as photosynthetic bacteria and algae, have evolved mechanisms to prevent Rubisco’s exposure to oxygen. Other organisms, like bacteria, have evolved more efficient ways to remove these toxins. These natural solutions have inspired many researchers to try to tweak photorespiration to improve crop yields. 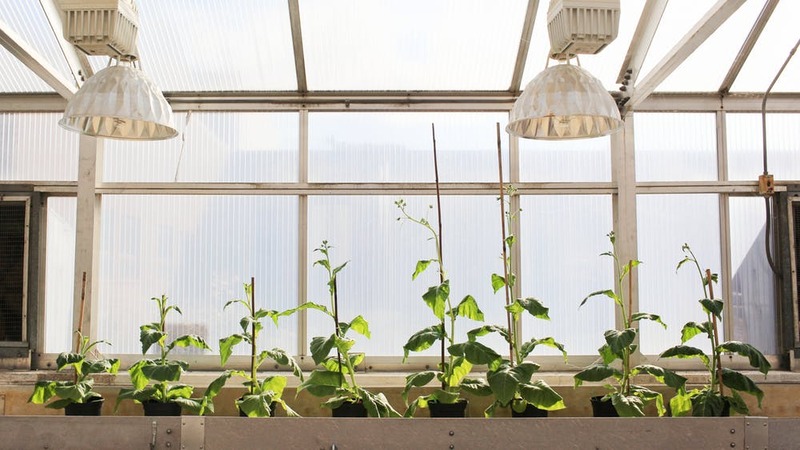 Some of the more efficient naturally occurring recycling pathways have been genetically engineered in other plants to improve growth and photosynthesis in greenhouse and laboratory conditions. Another strategy has been to modify natural photorespiration and speed up the recycling. These direct manipulations of photorespiration are crucial targets for future crop improvement. Increased atmospheric carbon dioxide from fossil fuel consumption boosts photosynthesis, allowing the plant to use more carbon. You might assume that that this will solve the oxygen-grabbing mistake. But, higher temperatures promote the formation of toxic compounds through photorespiration. Even if carbon dioxide levels more than double, we expect harvest yield losses of 18 per cent because of the almost 4 degrees Celsius temperature increase that will accompany them. We cannot rely on increasing levels of carbon dioxide to grow all the food we will need by 2050. I worked with Paul South, a research molecular biologist with the U.S. Department of Agriculture’s Agricultural Research Service and professor Don Ort, who is a biologist specializing in crop science at the University of Illinois, to explore whether modifying the chemical reactions of photorespiration might boost crop yields. One element that makes recycling the toxin glycolate so inefficient is that it moves through three compartments inside the plant cell. That’s like taking an aluminum can into three separate recycling plants. We engineered three new shortcuts that could recycle the compound in one location. We also stopped the natural process from occurring. Agricultural research innovations can be rapidly tested in a model species. Tobacco is well-suited for this since it is easy to genetically engineer and grow in the field. 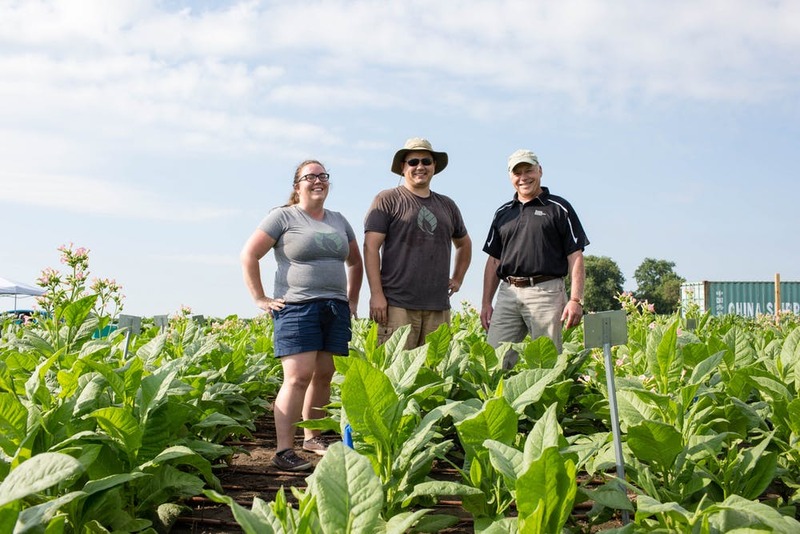 The other advantage of tobacco is that it has a short life cycle, produces a lot of seed and develops a leafy canopy similar to other field crops so we can measure the impact of our genetic alterations in a short time span. We can then determine whether these modifications in tobacco can be translated into our desired food crops. We engineered and tested 1,200 tobacco plants with unique sets of genes to find the genetic combination that recycled glycolate most efficiently. Then we starved these modified plants of carbon dioxide. This triggered the formation of the toxin glycolate. Then we identified which plants grew best – these have the combination of genes that recycled the toxin most efficiently. Over the next two years, we further tested these plants in real-world agricultural conditions. Plants with the best combination of genes flowered about a week earlier, grew taller and were about 40 per cent larger than unmodified plants. Having shown proof of concept in tobacco, we are beginning to test these designs in food crops: soybean, cowpea, rice, potato, tomato and eggplant. Soon, we will have a better idea of how much we can increase the yield of these crops with our modifications. Once we demonstrate that our discovery can be translated into food crops, the Food and Drug Administration and the USDA will rigorously test these modified plants to make sure they are safe for human consumption and pose no risk to the environment. 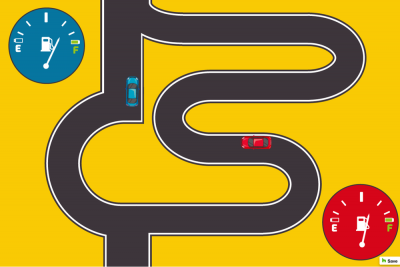 Such testing can cost as much as US$150 million and take more than 10 years. Since the process of photorespiration is common across plant species, we are optimistic that our strategy will increase crop yields by close to 40 per cent and help find a way to grow more food on less land to be able to feed a hungry global population by 2050.